Winter weather can bring heavy loads on trees and shrubs. The combination of accumulated snow and ice with or without wind can stress trees and shrubs to the breaking point. Most failures will occur at the root plate where the trunk and root system join, at branch unions, or along stems and branches. Some of these failures can be prevented others can only be repaired. Root plate failures are caused by root rots and can usually only be detected by a trained arborist. But there are some signs that should raise alarms. Die back in the top of the crown of the tree can indicate that the roots are failing to provide water to the leaves because they are in poor condition. Mushrooms and other fungal fruiting bodies around the base of the tree are another indication of root rot. When the roots are rotting, the additional weight of snow or ice can cause the tree to snap at the root plate and fall over. This is not only a winter hazard and anytime these signs are observed a certified arborist should be employed to evaluate the health of the tree. Normally trees grow branches in a way that wraps trunk wood over branch wood and creates a strong union between the tree and branch. In some cases, usually when the angle between the branch and trunk in narrow, this fails to happen. Good branch unions are easy to see; a ridge of bark occurs on the upper side of the crotch between the branch and trunk. The bark ridge is formed when the bark of the trunk and branch push against each other as they grow. Bad branch unions have no ridge and the bark is between the trunk and branch. In these bad unions, the trunk and branch push against each other and this internal force is multiplied by accumulated snow and ice, causing the branch to tear away from the trunk. Removing these poorly attached branches when the tree is young can prevent them from developing into large expensive problems later on. On older trees where large limbs or co-dominant leaders have developed and removal is not on option, the branches or leaders may have to be cabled. Included bark is another reason to employ a certified arborist. As an example, Bradford pears are notorious for having bad branch unions, which is why they eventually split apart. Unfortunately there is little that can be done before a storm to prevent stems and branches from failing between joints. This type of failure is essentially the same as breaking a piece of wood over your knee. Failure occurs when the weight on the end of the branch is greater than the strength of the branch at the point of the break. One thing that can be done is to observe the sweep of the branch; sudden angles or crooks will stall the transfer of energy from the end of the branch to the trunk and cause a weak spot. 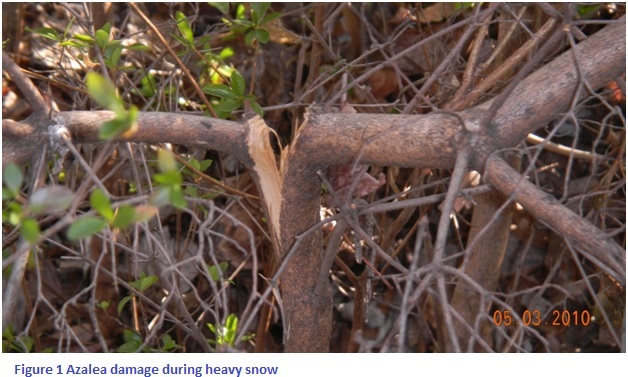 Branches with kinks can be reduced or removed before the storm to reduce the possibility of breaks. During the storm accumulating snow or ice can be removed from smaller trees and shrubs with a broom or rake to reduce the weight on the ends of the branches. When thinking about repairing a tree or a shrub after storm damage it is important to know that they do not heal damage they seal it. That is they will grow new wood over the damaged area to seal it off. So repair is about helping the tree or shrub do this. It is also important to realize that, while they can do this along the trunk or stems, they are much better at sealing at branch unions. When branches completely fail at a branch union there is usually a tear along the trunk or stem below where the branch was. This tear is usually ragged. Using a sharp chisel to smooth out the wound edges will help the tree seal over the wound. The exposed area should be monitored for signs of decay that can threaten the health of the tree. DO NOT SEAL THE WOUND! When there is a partial failure at a branch union and the branch is still partially attached, the split can be repaired by bolting the pieces together. Drill a hole through the branch and stem, insert a bolt with washers on both sides and tighten the nut to bring the parts back together. Cut off any excess of the bolt beyond the nut. NEVER remove the bolt, the tree or shrub will grow around it, further strengthening the repair. 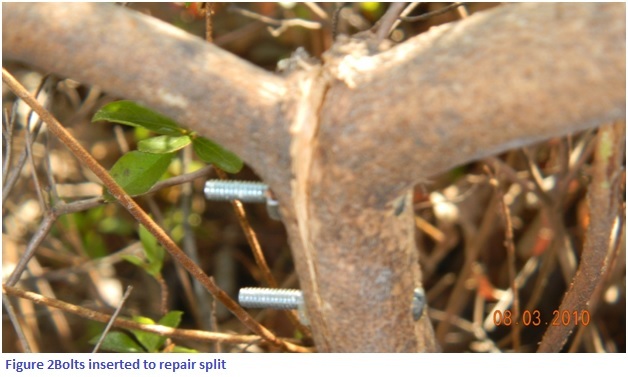 When branches break between joints, reduce them to the nearest joint or remove them using proper pruning cuts. Trees and shrubs are primed to seal off wounds at branch joints. By making good, clean cuts at the joints you can work with the tree to seal off the damage from the break. DO NOT SEAL THE WOUND! One important note about tree repair: TREE CLIMBING IS VERY DANGEROUR AND SHOULD ONLY BE DONE BY A TRAINED PROFESSIONAL! If you cannot do a repair from the ground, hire a certified arborist to do it.